Will it slide to much on the floor. Are do I need to put some kinda backing underneath the rug ? I dont use any backing but I pick mine up after each use. If you plan on leaving it on the floor then I would definitely consider putting down some sort of non-stick padding. I used two contrasting colors in cones. I didnt use all of either one if that helps. I always buy cones cause I hate running out in the middle of a project. It is 16″ X 20″. Maybe you should add that to your description. It is a cute rug and I am sure you will get this question again. You are very unclear about how much yarn is needed. A skein of EACH color? 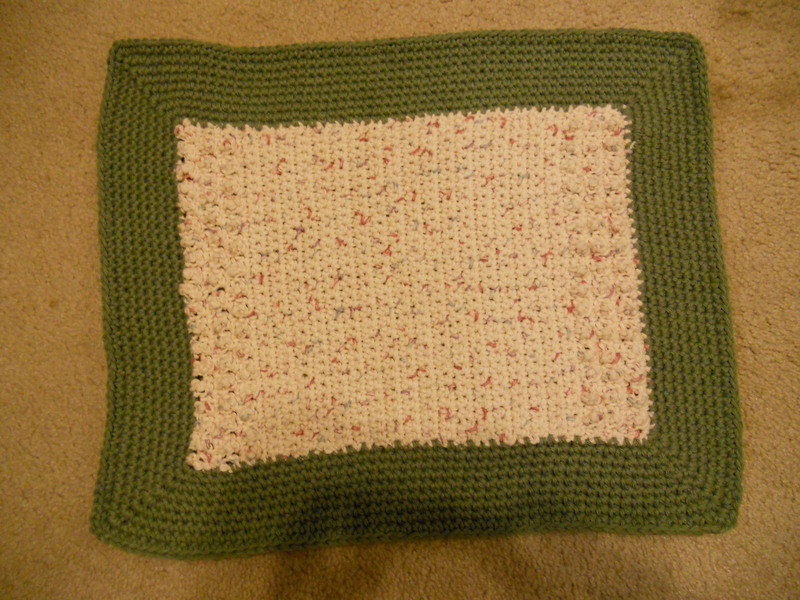 Isn’t a size G hook too small for worsted or is this a tightly crocheted rug? I used a cone of each color and did not use all of the cone of either one. If that helps. I have used a size G for umpteen years for worsted weight. Works great! I have made this rug three different times. Twice in cotton and once in acrylic. I have given them all away as gifts. Everyone who received one was delighted. Easy pattern. Works up quickly. Very cute. Thank you for your comment. Im always happy to hear that someone has tried my patterns and liked them. Definately going to try this one! Thanks! This looks great and something I am going to try. Thanks for sharing your pattern. How would you add a backing to it? I would just cut out a piece of non skid material and place it under the bath mat.